Why are the markets so excited that the smartest guy in the room takes his name out of the running for the (second?) most powerful job in the world? With Larry Summers no longer holding back the markets, what’s next for the dollar, currencies and gold? While pundits debated what a Summers Fed would have looked like, the truth is that little was known about his views on monetary policy. Our own take was that given his highly political disposition, he may be more effective in his current role where he can call President Obama any time to offer his advice. Yet the markets rallied because uncertainty is reduced: with Janet Yellen as the front-runner, the odds of continued ultra-loose monetary policy has increased. Indeed, aside from a rallying stock market, the more noteworthy reaction is a global bond rally, especially on short to medium term maturities. That is, the markets expect lower interest rates for longer with a Yellen Fed. Of course, a wrench can still be thrown into this calculus, as a Yellen nomination is no certainty. In our assessment, Roger Ferguson, best known for past work on financial stability, could be the left-of-field candidate in case President Obama feels Ms. Yellen should not get the job. Contrast that with the European Central Bank (ECB) that’s actually mopping up liquidity. It’s not that the ECB is so hawkish, but their printing press is wired differently: instead of buying some seemingly random amount every month, the ECB’s balance sheet is demand driven. That is, when banks request liquidity (cash), the ECB provides it in return for qualifying collateral. The very reason the crisis in the Eurozone erupted may be because the ECB didn’t print a boatload of money to patch up the system. It was only in late 2011 that the ECB ramped up its lending facilities dramatically, most notably with what amounted to approximately €1 trillion in 3 year financing (known as the 3 year LTRO). 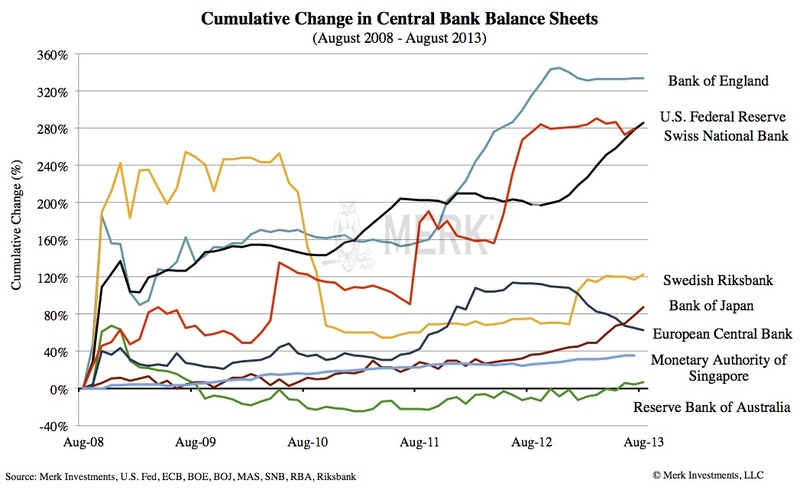 The reason the ECB balance sheet is now shrinking is that banks are allowed to return their money early. So while we talk about tapering, the ECB is not only tapering, but mopping up liquidity. Should it come as a surprise that the euro is the best performing currency year-to-date? Last year, by the way, with all the trouble in the Eurozone, the euro also outperformed the U.S. dollar. That’s how well the cleanest of the dirty shirts has been performing. It seems to me that the seemingly clean shirt has been trading on unrealistic expectations that it might outshine the rest of the laundry. There’s more at work than printing presses around the globe. 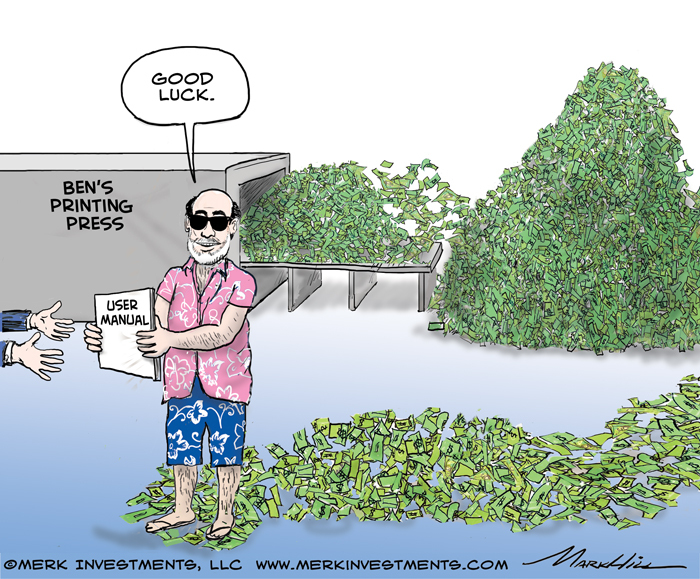 In the U.S., we have been told that tapering must be good for the dollar. We challenge that notion. Indeed, historically speaking, early to mid phases of tightening cycles have been dollar negative. That’s because purchases of Treasury securities by foreigners might be reduced as the bond market turns into bear market territory. It’s during late phases of a tightening cycle that the dollar historically benefits as the next bull market in bonds is anticipated. The one caveat with this theory is that this is certainly no “normal” environment. In today’s environment, we would like to point to a much bigger threat. Some may think it’s inflation, and indeed we are concerned about inflation. But the market appears complacent about inflation. What the market does appear to be concerned about is economic growth: when good economic indicators are released, the bond market has tumbled of late. Now imagine an environment where we get good economic growth. What would happen if so-called pro growth policies actually worked? Pundits might applaud rising rates as a sign of an improving economy. However, at some point, someone is going to look more closely at the cost of financing government debt. The average cost of marketable U.S. government debt has slipped below 2%, down from over 6% in 2001. Where will we be in 5 or 10 years? As the cost of servicing the national debt rises, other government spending will likely be crowded out. Our politicians don’t appear too concerned, as one can always take out more debt. But the math does not add up, especially with mounting entitlement obligations. Having said that, we only have to look at Europe to note that it’s the perception that matters even more than the math: Spain, with rather prudent debt management and an average maturity of approximately 7 years on its government debt, struggled as investor confidence plummeted. Europe teaches us another lesson: only when the bond market imposes reform will politicians get their act together. But different from the Eurozone, we have a current account deficit in the U.S., making the greenback potentially far more vulnerable than the euro has ever been. What you see is what you get. European politics will morph into new phases, but don’t expect miracles, not from German elections, treaty changes or other miracles. Last weekend, in Bavarian state elections, the liberal party (FDP) was kicked out of parliament, giving the conservatives (CSU) an absolute majority. For conservative Bavaria, that’s not too surprising, but what’s relevant for federal elections this weekend is that it may increase strategic (sympathy) voting for the FDP, the junior coalition partner in the Merkel government. As such, while it is a tight race, we believe a status quo with a continuation of the existing coalition is the most likely scenario. But even if the government in Germany changes, the social democrats are in no mood to write blank checks for the rest of Europe. If anything, there may be different nuances, with increased rhetoric focused on growth. More important is what has been hiding in plain sight: risks are increasingly priced where they belong. That may sound like an abstract statement, but consider what happened during the peak of the Cyprus debacle: during this time, Spain issued Treasury bills at the lowest yields since the early 1990s. The then new head of the Eurogroup, Mr. Dijsselbloem at the time was quoted as saying Cyprus should be a model for Europe. He later clarified his comments, but did not budge on substance that the era of bailouts is over. Indeed, Mr. Dijsselbloem, who is also the finance minister of the Netherlands, allowed a Dutch bank to fail a few weeks before the Cyprus crisis caused international headlines. The problem with guarantees is that everything is safe until the guarantor fails; the way a free market ought to work, however, is that the risk is spread and the failure of any one player won’t wreck the system. Sure enough, ever since last August, we have had more discriminating markets. Sure enough, there will be failures going forward, but those risks ought to be reflected in the respective securities, not necessarily the euro. Last August we published an analysis entitled Draghi’s Genius that goes into more depth as to why the dynamics in the Eurozone have changed. At the time we published the analysis it was most controversial. While we continue to have many skeptics, the market has proven us right so far. In the meantime, we will change our mind should political dynamics unfold differently from how we foresee them. Today’s investors in Spanish and Portuguese bonds are different from those a few years ago. A few years ago, investors viewed these securities as risk free. That money fled. The money that’s piling into Europe’s periphery now is yield-chasing capital, capital that’s aware of the risk. That’s a much healthier place to be. As more capital flees emerging market debt where volatility has exploded, we expect more inflows to the Eurozone periphery. This is not an investment recommendation, as we don’t think one is properly compensated for the risks; but that's why we refer to such investors as yield chasers – and there are lots of them. In a nutshell, don’t expect tapering to rock the world. Far more import will be the vision articulated by Bernanke’s successor. Please register to join us for our upcoming Webinar this Thursday at 4:15pm ET, “What’s Next for the Dollar? #Taper” to continue the discussion on the fallout for the U.S. dollar and currencies of Fed policy. Also make sure you subscribe to our newsletter so you know when the next Merk Insight becomes available.